Moser Roth is the chocolate brand on sale in Aldi - and it's exceptionally good value for money. 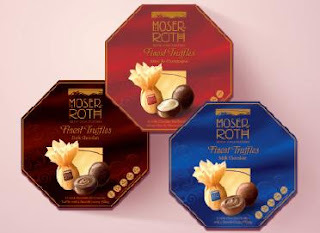 Recently I purchased a box of the Moser Roth Finest Milk Chocolate Truffes for 2.50 (I think) and they are simply delicious. Each truffle is individually wrapped and to be honest, I doubt that I could tell the difference between them and the more premiumly-priced Lindt truffles. Pick up a box today and put them to the test. Just tried Moser Roth 'Cognac Praline' liquor filled chocolates, delicious, years since we have enjoyed chocolate so much! !